Diploma exams must be administered according to the scheduled dates and times. All diploma exams, except those that are asterisked, remain secured after administration. 9:00 A.M. – 11:30 A.M.
All students are provided with up to double the official time as noted above, if they require it. Principals may decide to start the administration of the diploma exams early when more than one diploma exam is scheduled on one day. Students writing morning diploma exams cannot be dismissed until 10:00 A.M. and students writing afternoon diploma exams cannot be dismissed until 2:00 P.M. Please note that the order of the diploma exams that are scheduled on the same day cannot be changed. 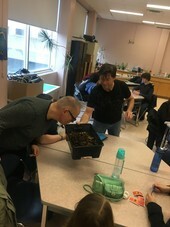 http://eipsnextstep.ca/spo/whats-new/post/bake-sale - Join the Sherwood Park Outreach Senior High Leadership Group in donating to the Youth Co-op. Friday, December 7, 2018 from 9:00 am to 3:00 pm. Items are as low as 50 cents! Free hot chocolate with purchase! Full details of our vision, goals and strategies for working with our students. Stay current! Sign up to receive our informative Newsbites. Your alternative for academic success.